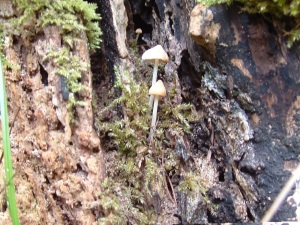 Observation - Mycena sp. - UK and Ireland. Description: Cap conical, radially fibrillose, pale cream-orange, 3-6mm. Gills creamy white. Stem white 2mm wide, ring and veil absent. Height 15-20mm, growing in small troop on dead wood. Cap conical, radially fibrillose, pale cream-orange, 3-6mm. Gills creamy white. Stem white 2mm wide, ring and veil absent. Height 15-20mm, growing in small troop on dead wood.